The state of New York, New York city in particular, is known for being something of liberal bubble. This doesn't just mean the almost half of the city voted for Bernie Sanders in the primaries, but it wouldn't be amiss to see one passerby on a leash and the next strolling naked in full body paint. New York is live and let live, which is why it's still shocking to remember tattooing was only made legal in the city in 1997, after a 40-year-old ban was lifted. Of course, during tattoo prohibition, inking was absolutely present, but the legitimization of the trade allowed those in hiding in the dark to step into the light. 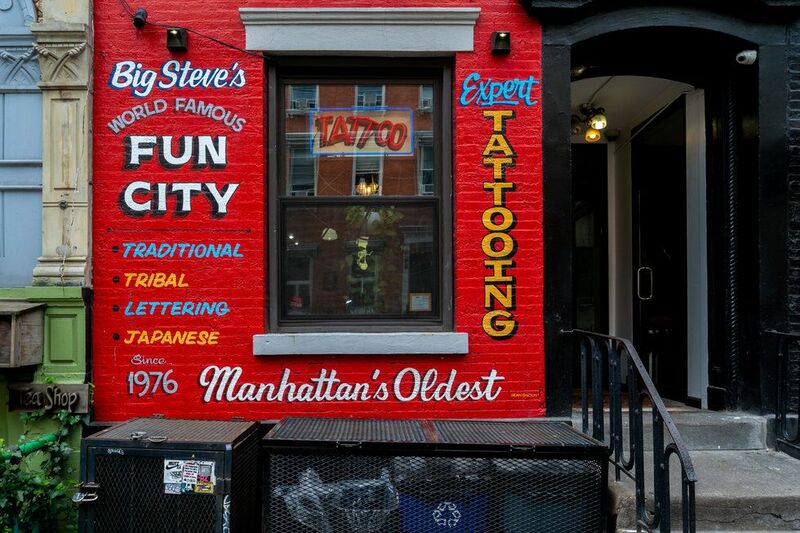 Enter Fun City: the city's first-ever storefront tattoo parlor. Opened illegally in 1976 by the mythical Jonathan Shaw (known for tattooing the likes of Kate Moss, Johnny Depp and Iggy Pop), the shop was passed on to a former shop boy and now co-owner Steve "Big Steve" Pedone — who walked in the parlor at age 18 and hasn't left since. Continuing Shaw's legacy, Pedone continues to attract celebrity clientele aplenty. From Demi Lovato to Miley Cyrus to Young Thug, there are few tattoo-enthusiasts — New York City-natives — who are unaware of the Queens-born tattooist, or haven't been touched by his needle. PAPER caught up with the legendary artist to talk tattooing's social media revolution, his most-memorable pieces and what it takes to come out on top. 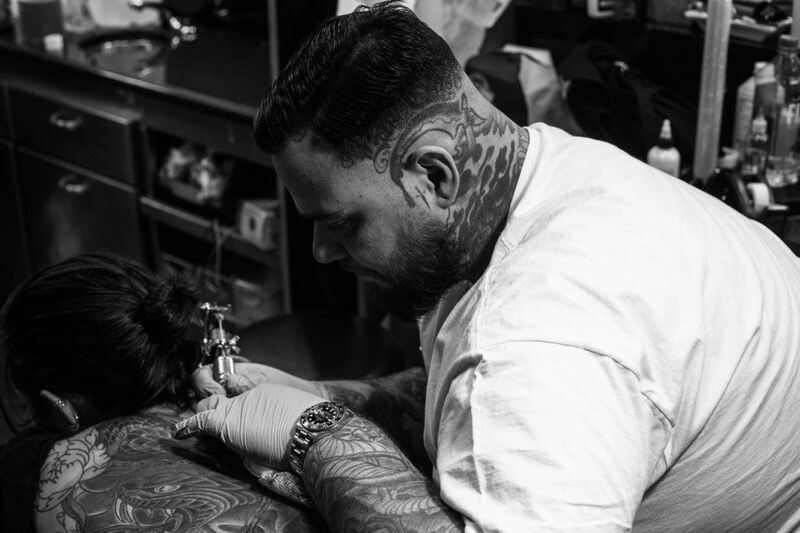 How has the studio evolved since tattooing became legal in NYC? What sets it apart from other shops in the city? The studio itself has gone through its fair share of physical and mental renovations. Maxx and I try to lead by example to keep the shop moving forward with a positive mental attitude, good vibes, and a solid crew. There aren't many — if any — tattoo shops in the city that give people an experience to go along with their tattoo(s) like Fun City does. The shop has always been about more than just tattooing. Fun City is known for its famous clientele, do you have a particularly memorable tattoo for a celebrity? I think one of the reasons people come to Fun City is because I, and our whole team, treat every client the same way–celebrity or not. I don't think many people who live in the public eye are used to that. How was it working with the Jonathan Shaw? What was your biggest takeaway? I'd be lying if I said it was easy, but that guy taught me how to make money, how to hustle, and I got to work with some of the best artists in the industry. That environment set a pretty high standard for my own career; so, I owe that dude a lot. My aesthetic is all over the place. I came from a traditional American tattoo background but always had friends who wanted fine-line tattoos so I never had the chance to specialize in one particular style. Because of that, I'm confident doing pretty much anything that walks through the doors here. What do you wish more tattooists were aware of before pursuing the profession? That's a tough one. I guess I'd say a lot of people think it's easy and it's not. With social media these days, anyone can make a name for themselves and build a hype around their work but, even though I've been tattooing since I was 19, I learn something new every day. What trends have you noticed emerge throughout your time at Fun City? I've seen a lot of trends come and go over the past 17 years at Fun City but they always seem to come back around. 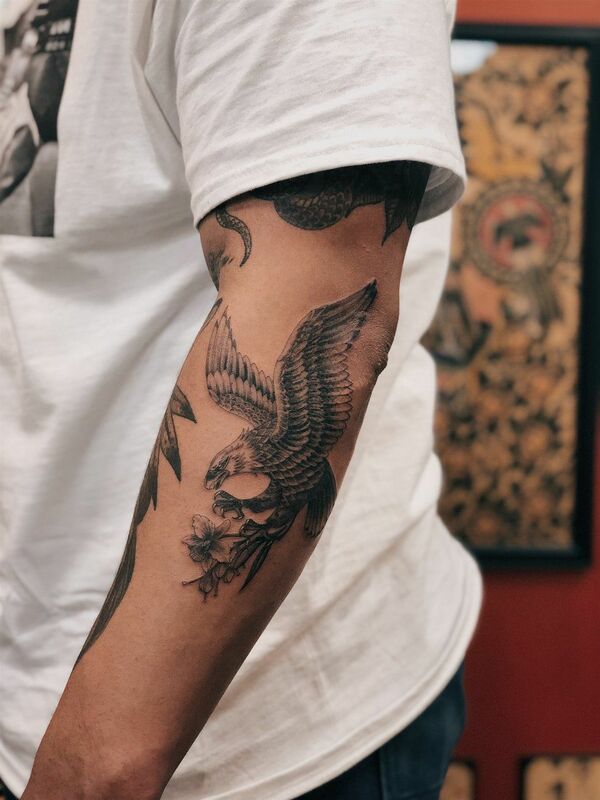 Even though black and gray, fine-line tattoos have become as popular as they have, I still have people come in looking to get something classic. What do you believe to be the future of tattooing? What do you predict the next generation will bring to the table? Over the last five years or so, tattooing has become more and more mainstream and it's not as difficult as it used to be to obtain. I hope the next generations of tattooers will worry less about the attention their tattoos get on social media and more about getting better at what they're doing. Same goes for the next generation of people getting tattooed: worry less about the artist's follower count and more about the quality of their tattoos. Check out the best of Big Steve's tattoos below.